Tortola (Turtle Dove) is the largest island in the British Virgin Islands archipelago. Travellers can look forward to a charming land of rolling hills and sandy beaches, where time flows with the grace of waves lapping on shore. Mount Sage lies at its centre. As Tortola's highest elevation, the mountain offers wonderful views of the destination's lovely bays, uncrowded beaches, surrounding islands and tropical vegetation. Visitors will also see the scattered ruins of 18th century buildings, which are reminders of the plantation era, when rum and sugar drove the island's economy. Tortola's scenic capital, Road Town, sits around a deep, yacht-filled harbour. Hotels, quaint island-style shops and cheerfully painted restaurants add to the locale's appeal. Travellers will find local and international cuisine, and specialities such as fresh lobster, turtle dishes and coconut curries are highly recommended. 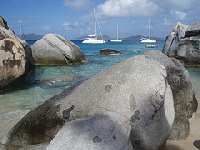 All in all, Tortola's charm comes from the warmth of its people, and its quality as a sailing destination. Indeed, its clear waters, reliable trade winds and close proximity to other islands make it one of the world's foremost yachting hubs.